This is exactly what happened to audIT founder and CVO Frank DeBenedetto recently. But more importantly, it’s not a fluke. It’s just another typical day at his MSP thanks to audIT. Clients of audIT may not realize that Frank doesn’t work in audIT full time. We have a CEO and a great team, including little old me, that run audIT day in and day out. The reason for this is Frank actively runs his MSP. In fact, the whole reason he created audIT was to use in his own MSP. So not only is Frank involved in audIT, he’s one of our top users as Two River Technology Group in New Jersey. In addition to get to hearing all the amazing feedback and case studies from our clients, Frank regularly shares his boots on the ground successes thanks to audIT. He recently gave a presentation to a prospect who was dramatically underpaying for their IT. As an MSP of 2 million in annual revenue and 8 employees, Frank runs an efficient and successful MSP. And like most other successful MSPs, he doesn’t compete on price. He charges the right amount of money and provides the right solution. But more and more MSPs don’t. Instead, they pitch the price they think their prospect will pay because they want the money and are afraid to lose the business. Then they are forced to underserve the client. Things are always going wrong. As a result, instead of charging five times as much, they are spending five times the time and effort fixing issues. And in the end, they get all the blame and the client just goes out to find a new MSP when their contract is up. Sound familiar? Frank and all the successful MSPs I’ve had the privilege to know, would rather turn down a client than take on a headache at a low price. So they make much more money per client with far less headache. And that leads to more great clients because they get quality referrals from doing a great job. After years of using audIT, Frank and I have a good laugh now when this happens. And there’s one big secret for this. This is something audIT clients get but struggling MSPs who are too stubborn to embrace don't. Confused prospects never buy. And If they do it’s because you're the lowest price. The big reason MSPs let this happen is they don’t have a system like audIT. A sales tool for MSPs that provides an easy way to present tech in a way that’s the opposite of confusing. And that gives them the confidence to be the highest priced MSP. And here’s the secret: If you can demonstrate, in a clear and concise way, exactly how the prospect is being underserved and what they need to do, you will be able to get them to sign up at any price. 1. To make your presentation so simple to understand that a teenager will get it. 2. Show them the impact it will have on their business. 3. And do it while being trustworthy and believable. This is almost impossible to do unless you spend the time and effort to make a impactful and professional presentation. And the sad truth is most people don’t. They take the lazy way out and just print off a technical report that just confuses the prospect. Or the presentation just doesn’t look professional. And the result is this prospect is now spending five times what he was. Without objections. Without complaints. Without negotiations. This is why Frank’s MSP is generating 2 million a year and runs like a finely tuned machine. This is why he can work on a project like audIT and take time off without having to worry about his MSP. And this is what you can do too in your MSP when you use audIT! audIT is more than sales tool for MSPs. It's also a QBR tool. 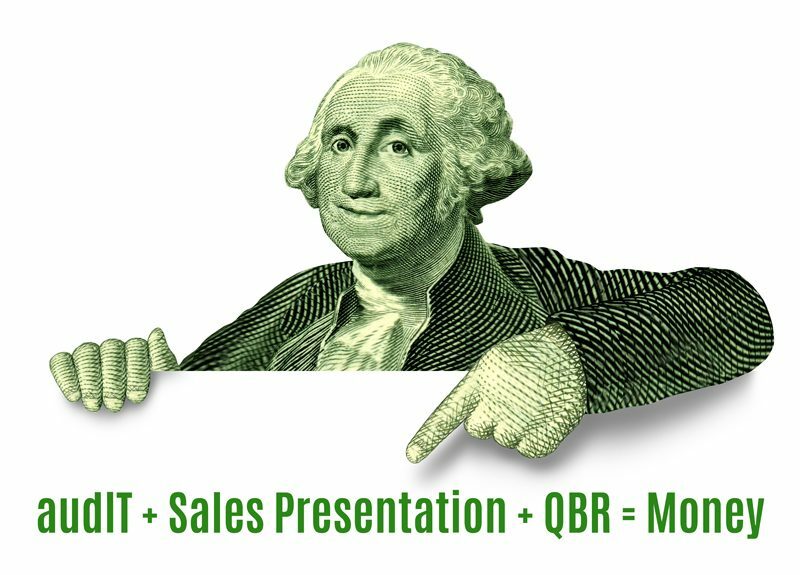 It will make your next presentation simple, impactful and like Frank... hopefully results in five times the revenue for you too! Download a sample report then try it free for 15 days.